Global unemployment being at 200 million according to the ILO, there a lot of people writing cover letters and polishing up their CVs. Jeff Sachs, celebrity economist and aid proponent, has joined the group of job seekers, though in a tougher political environment than most. He probably didn’t help his cause by almost contradicting himself within a week, and his CV might need a lot of polishing. I’ll stand on my record of helping to create those networks: to launch the Global Fund to Fight AIDS, Tuberculosis, and Malaria; to bring new support for the world’s poorest farmers so they can boost yields, production and income; to scale up the role of community health workers; to translate debt relief into poverty reduction; to link the poorest countries to global markets in support of exports for growth; to make mobile technologies the new edge of development practice; and to link climate science with solutions. My role has been to help bring together vastly diverse communities of knowledge, power, and influence to see what can work in practice and then to help make it happen. I am ready to lead the bank into a new era of problem-solving. Yet the policy is backfiring on the US and badly hurting the world. Because of a long-standing lack of strategic expertise at the top, the Bank has lacked a clear direction. Many projects have catered to US corporate interests rather than to sustainable development. Left out of his CV are some of the most controversial years of his experience – 1985 to 1993 when he served as an economic advisor, first in Latin America, and then in the former Soviet bloc, including in Poland, Russia, Estonia and Slovenia. The “shock therapy” he designed for those economies – massive liberalisation and privatisation – has been controversial. In the case of the Soviet bloc countries it has been argued that it contributed to them plunging into recession, seeing increased unemployment, and in the most spectacular case of Russia, led to the rise of the first wave of Russian oligarchs who profited handsomely off the fire sale of state assets. We all make mistakes… Has he learned from them? Should Sachs be interviewed for the job in the end, let’s hope his interview panel asks that interesting question about failures that the candidate has learned from, and that Sachs can give the easy answer. Many civil society organisations would no doubt be pleased to see Sachs as the US nominee, his having been instrumental in calls for greater aid, more debt relief, and a focus on spending on social services like health and education. His friendship with Bono might bring some glamour as well. Can he convince Lael Brainard and President Obama to tip him for the job? This entry was posted in Candidates, The Process and tagged Jeffrey Sachs by Peter Chowla. Bookmark the permalink. >Is Jeffrey Sachs raising any of these points or producing a manifesto? Sachs has made very big claims for his heavy-aid approach to development, and I’d love them to be true, but I don’t think they’re fully verified yet. The Millennium Villages were supposed to graduate from aid in five years; no sign of that happening yet. So I’ve grown a lot more sceptical about the Sachs approach over the years. Yeah, I think that the long appeared narrative is being an expression of impression and self reflections also mixed up with some proverbial words and bowed his head to serve better of the poor world. He has been partly as economic medical doctor to cure and fight against all named deases and risks ahead. In a very fundamental sense, he has long tagged with most poor countries and laid along with all of them. Hoped he could be a cool bridge to laise amongst the poor and rich as well as poor agriculture economic versus hight tech based artificial economy of development. Jeff Sachs will not be the US nominee, despite the audacity of putting his application to the op-ed page of the Washington Post. Civil society lobbyists would no doubt criticize his work in Poland, shock structural adjustment that, inconveniently, worked. His approach to development economics has its fans, and its critics, including ex-World Banker Bill Easterly, and most of the impact evaluation scholar-practitioners. Having a leader who is controversial can work. Robert McNamara achieved greatness, for the time he led it. After a rocky start, so did James Wolfensohn. What they delivered was more focus on health and education, and global debt relief. Both delivered on support for poverty reduction. 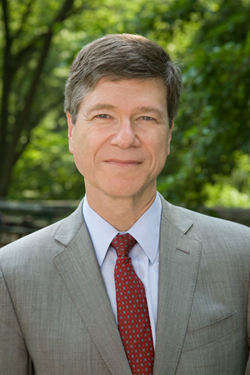 Jeff Sachs has been an articulate advocate for development, but what has he delivered with his charisma? While his self-nomination has development professionals across Washington buzzing this morning, Sachs’s contribution is not in putting himself forward for a job he won’t get, but in advocating for focus, leadership, and direction at the Bank. This is a plea that the nominating governments, and their agents on the Bank’s board would do well to take seriously if they take the World Bank seriously. The American banker, politician or bureaucrat they select to rebuild starting July 1 has to deliver on that. Don’t just read his article, read the comments. So far, very few support his candidacy, and the scathing sarcasm is hilarious. Though of course, not as hilarious as your “poll” in which Sri Mulyani came on top. Remind you of the “new Seven Wonders of the World” poll on the Internet (In which many votes were received for the Statue of Liberty)? ?